Tuesday was the last day of school, and I scheduled a skype session with an author with the middle school book group, BRiMS, during their last lunch period for the school year. The timing was not very good, but I felt that I had no choice. The week before was BRiMS last meeting for the year, and the kids needed time to get Airborn read for that discussion. 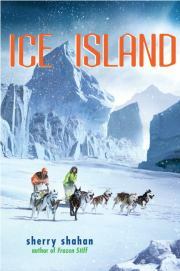 I wanted as many kids as possible to read Ice Island in anticipation of the skype with author, Sherry Shahan. So I needed to have some distance between the regular meeting and the skype session, to give the students an opportunity to read both books. Every day for a week I reminded the students of the skype in the daily school announcements. I emailed all the students several reminders. Then on Monday, all the students had to get their end of the year check off sheets signed. I made a point to tell each of the members of BRiMS individually that the skype event was for Tuesday at lunch, and they all assured me that they would be there. As you can see by the picture below, the turn out was not as I expected. There are 14 members of BRiMS and all were at school on Tuesday. I need to remind myself not to schedule a library event on the very last day of school next year. I might forget. Now let me tell you about Sherry Shahan. She has written dozens of books both fiction and non-fiction for middle school students and young adults. Last year, we received a wonderful handmade card from Sherry after one of my high school students wrote a review of her book, Purple Daze. On Tuesday, she was visiting with us to talk to the students about her book, Ice Island. It is set in Alaska, and the story revolves around a girl who would love to have a team of dogs and race in the Iditarod. A short practice run with an Alaskan native turns into a five day fight for survival. Sherry told us what spurred her to write this book. She had traveled to Alaska for her non-fiction book about the Jr. Iditarod and had time to do a bit of traveling to St. Lawrence Island. This trip was the impetus for Ice Island. This is a really good middle school read for kids who like survival stories, dog stories, or action adventure stories. Sherry is a wonderful story teller. She also spent some time telling us about her trip hiking Mt Whitney when she was doing research for a magazine article. The hike turned into a nightmare when a lightning storm hit, and there was no where for them to go for protection. Her tale was quite harrowing. She did write an article about the experience, but she also wrote another survival story called Death Mountain based on her experiences. All of us in the room wanted to read that book after she described how she used the facts of her trip up the mountain to write a fictional story. She read from one of the chapters, and I can't wait to get it for the library. Thank you Sherry. Though I did not have a crowd in the library, the ones who participated loved hearing what you had to say.